Trustees of the Bonner General Health Foundation Board present a check for $65,520.68 to the BGH surgical department to purchase an orthopedic surgical table. The promise of healthcare philanthropy is the ability to change lives and the power to save lives. Bonner General Health's Foundation Board of Trustees develops the resources that help keep and expand that promise to the people who trust Bonner General Health to care for them. The Bonner General Health Foundation is committed to advancing the promise of life through philanthropy. Bonner General Health Foundation is a key developer and trustworthy steward of the resources and goodwill that enable Bonner General Health to provide the highest quality of healthcare to our community. 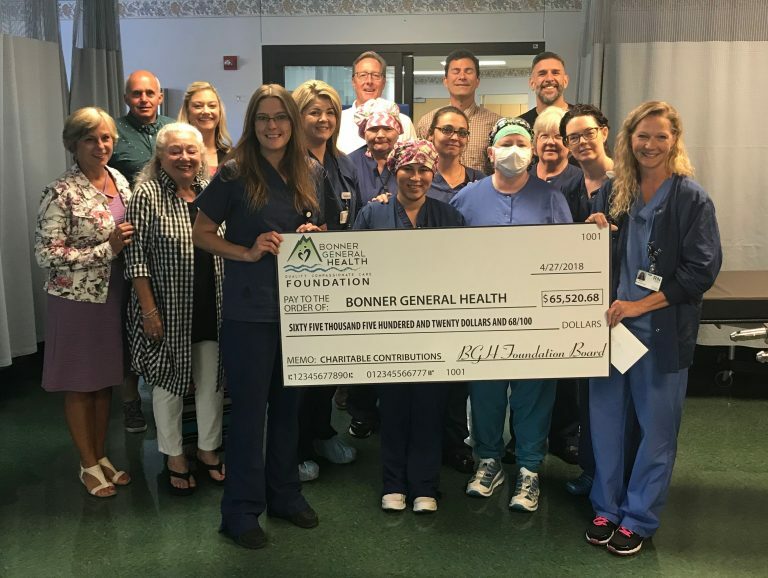 Through our philanthropic support of the hospital, we will endeavor to enhance the quality of life for those who trust Bonner General Health to care for them. Our biggest fund raiser is our annual Heart Ball. This event is held the second Saturday in February, and it features a three course dinner, live auction and dancing! Funds raised from this event directly benefit services provided at Bonner General Health. We accept contributions from individuals, corporations and other organizations. All gifts are tax-deductible to the extent allowed by law. Donors can request their gift be allocated for a specific purpose, or given as an unrestricted donation to be used where the need is the greatest. Gifts to the Foundation may be made in a variety of ways. Thank You to Everyone Who Helped Make Our 11th Annual Heart Ball Our Most Successful Yet!